This is what I see when my wife goes places and changes shoes or slippers...I don't know if you can tell but she always manages to reverse them. In Korea people wear waterproof slippers/shoes in the bathroom to keep their feet dry. They have the whole "my entire bathroom is my shower so all the floor gets wet" scenario going on. Of course it makes it easier to clean the bathroom--all you have to do is take a long shower and spray it all down. That was how I first noticed her quirk. She always reversed the shoes and now that we're married I get the biggest kick out of it at all hours of the day. 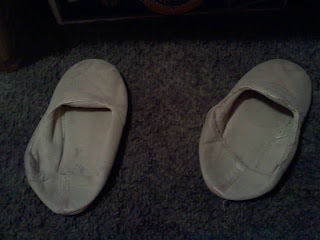 I came to bed and saw her slippers and all I could do was laugh. Cute...she's so darn cute. Thanks, Jay and Zakk. I've heard it said that these things are really special and that I'll grow to appreciate all of them but this is definitely one of the first that I've really taken a liking to. It's just so...my wife.